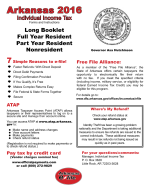 The Arkansas tax booklet is a guide for state residents on how to file their state income taxes. The guide features step-by-step instructions on how to file by mail or e-file your state taxes. In addition, the booklet features information on every type of state tax form as well as areas where filers commonly make mistake.